So, I'm thinking about starting a cooking blog, or I should say I want to...no... I AM, I am going to start a cooking blog! But, I can't think of a name for the blog, any ideas? Please, Help! Thursday﻿, Feb. 17th, all the Young Women Leaders and I went out for a much needed girls bonding night! We went to a yummy dessert place in Orem, Chocolate. It's an old house with several rooms decorated really cute and full of couches, tables and chairs. We had so much fun, I loved it! Starting from the left and going clockwise: Kychelle, me, Chelsi, Ashley, Jaclyn, Colleen, Lori, Jamie and Emily. I love these ladies! Since Valentine's Day was on a Monday this year (which is Family Home Evening so I figured it might be a little difficult to find a baby-sitter) we decided to go out and celebrate the Saturday before. We walked around the mall and ate at Sweet Home Chicago Pizzaria. We love that place, it's so dang good! For dinner I made Chicken Florentine, an Italian salad and garlic parmesan bread sticks for dinner. It was all so yummy (if I do say so myself), I was just sad that Cameron was sick and didn't get to enjoy it as much as I was hoping. ﻿Cameron brought me these beautiful flowers and card, he's so sweet! We had a wonderful Valentine's, all except for Cameron having a horrible cold. I've had a few new additions to my family in the past couple of months. Two of the little ones I have not had the opportunity to meet yet :( It was so hard for me to know that 2 of my siblings were having children and that I wouldn't get to see them for a long time! 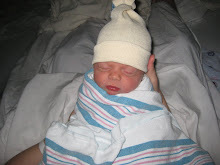 Bonny and her husband Chad had their 3rd child, Knox William Day born December 6, 2010. He was a chunk when he was born and has gotten to be an even bigger chunk! I want to cuddle this little guy right now! 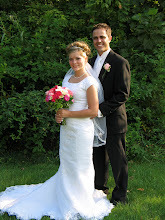 Spencer and his wife Audrey had their first little one, Kayleen Alyse Sommers on December 12, 2010! She was a tiny little thing, and still is! I can't wait to hold these little ones, hopefully sooner than later! Finally I got to see one of the babies! 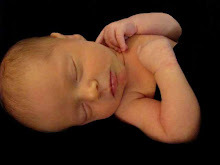 This little one is Cora Catherine Long, born February 11, 2011 to Geoff and Erin (their 1st child). I couldn't wait for Cameron to get home from work before visiting, so the boys and I went to visit all alone! The boys both loved holding her, and couldn't keep their hands off of her. The boys look so big next to her. I was so happy to finally hold one of these little babies! She was a heavy little thing! Don't you just love all of that hair? Isn't this the sweetest thing you've ever seen?! The day after they got home from the hospital, Feb. 13th, we had a huge family baby blessing! This was just the part of the Long family that attended, you should've seen all of her family. I have been wanting to refurbish a few pieces of furniture that were given to me by my in-laws (I still have lots more!). If it weren't for my friends Lori and Annie encouraging me to start, they'd probably still be sitting there unfinished. I only wish they didn't have the medal part, oh well I have to keep them or the legs would collapse, they look 10x better than they did. I cleaned them and scrubbed the rust off, so they're much better. When I called Annie for her help, she said why not bring over your end table and work on that too? So, I did! I forgot to take a before picture, so it's a good thing we have 2! This is the one that has been sitting down in our basement collecting dust and storing papers for us. The one I finished did not have paper stuck to it, but you get the idea. I did not have the vision to see how this piece of furniture could turn out good at all. But Annie sure did! And yes, that is a little green toilet in the background, but don't worry, it's never been used! Wow!!! Did you ever see that coming? Cameron was so impressed! He said it actually looks like a nice piece of furniture! Now I'm thinking I need to dust off it's twin, refurbish it and find a spot for it in our living room too! Thanks Annie for having "the vision" and teaching me your ways, you're great! She helped me finish these pieces all in 1 day! Hopefully sometime I'll have more furniture finished to show you! Last Monday, February 7th, I decided to start potty training Cade! He was so ready, he would come to me all the time and say, "I wet" or "I stinky." We went to the store and picked out underwear and a potty seat, Cade had a lot of fun and got very excited. The first time I sat him down, he was so excited but was too scared to actually do anything. Finally after a few tries he peed, I got so excited and that made him want to keep doing it over and over again! So, Monday and Tuesday he did amazing! He even started going to the bathroom on his own, w/o telling me! Wednesday he was a little thrown off b/c I babysat a couple of kids and he just wanted to play the whole time. He wanted nothing to do w/ wearing his underwear or going potty in the toilet and through temper tantrums when I refused to put a diaper on him! The same day he continued this behavior, until.... I was changing Connor's diaper and decided I would ask him if he wanted to go potty. He jumped up, said, "Uh huh!" and ran to the potty. As soon as he sat down I could see that look in Cade's eye, you know, jealousy! My plan worked!! He said he wanted to go potty too, and has been doing great ever since! The only thing is he has not gone #2 in the toilet yet, he just waits until nap time or night time when he has a diaper on and goes, kind of frustrating, but we're still working on that. I kept him naked pretty much all day, and I noticed whenever I put underwear on him is when he would have his accidents. So far he has only had one poop accident in his underwear and several pee, but nothing for that last 3 days!! So he is doing great! I'm so proud of him! Isn't he so cute in his undies? So, I'll just go ahead and apologize now for all the pictures, there are tons! But, I figured I could fit them all in one big post. I still have more stuff to blog about, so stay tuned :) This post consists of a whole bunch of random pictures. I always want to get pictures of the boys in the bath but my camera is always downstairs! I finally remembered to grab it this day. Sorry, I just had to do it. I tried so hard to get the boys to pose together so you could compare their bums, but the 2 pictures will just have to do. Poor little Cade has hardly anything to hold his pants up! And, well, Connor has more than enough. I'd say he has 2 of Cade's bums ;) Sorry if you're offended, I just think they're so cute! This little stinker looooves to eat! This was after he had already scarfed down his breakfast and he decided he wanted to go finish Cade's off too. He's probably watching Dora here. Once again we went to the Dino Museum, this time w/ a few friends. And as you can see here, he couldn't leave home w/o his cars. We went w/ 2 of my friends, Annie and Lori (they're in the background along w/ Annie's daughter, Brooklyn). Cade playing w/ his friend Brenton (Lori's son). Cameron has been participating in Stake basketball for the past month or so. We get to go and watch him play when they actually play before bedtime. I found Cade sitting like this during the game, don't you just love this picture! He's such a big boy! Lindsey and her son Gabe invited us to go to Kangaroo Zoo w/ them Tues, Jan. 18th. They had so much fun! Connor tried so hard to keep up w/ the bigger boys. This was such a sweet moment when Connor was trying so hard to follow Cade and Cade kept turning around to check on him, what a good big brother! They had a small section for little kids filled w/ Ikea toys, they enjoyed playing there for a bit. If you haven't noticed yet, Kangaroo Zoo is filled w/ blowup bouncing toys and slides. Cade was so proud of himself for climbing up the big snail. For some reason the boys all decided to fall at the exact moment I tried to take a picture. Cade loved all the slides, he couldn't get enough! Connor, still trying to keep up w/ all the "big" kids. We went to story time at the Library Thursday, the 27th, and the boys were sent home w/ these fun penguin masks.